QlikView developers are professional IT experts who extract data from various sources by using QlikView script editors. 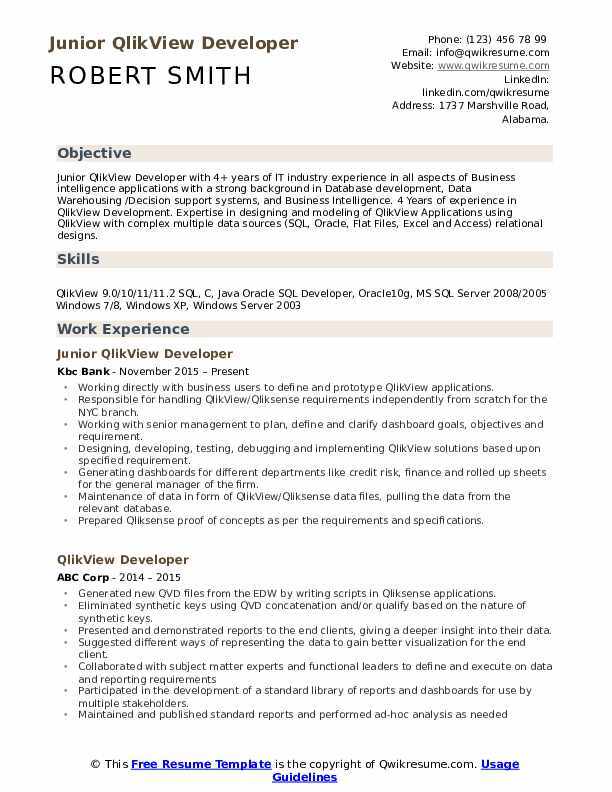 A well-crafted QlikView Developer Resume describes various job duties for these developers such as – managing QlikView servers, creating various QlikView solutions, designing dashboards, creating and maintaining technical design documentation, performing quality coding, ensuring that the QlikView server processes run smoothly, performing Qlikview administration and testing, extracting, transforming data from various sources into QlikView applications. 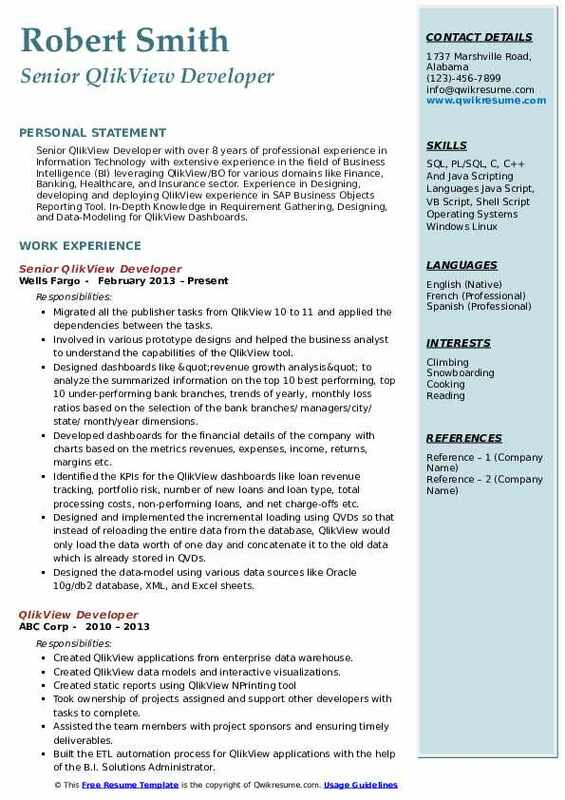 The common qualifications and skills that are mentioned in the resume for the job role are agile development expertise, a good understanding of data models and ETL procedures, advanced GUI development using Qlikview, ability to write efficient SQL queries and in-depth knowledge of database architecture. Employers prefer candidates who make a display of a degree in information technology or the related in the resumes, but highlighting experience in resume earns rewarding employment. 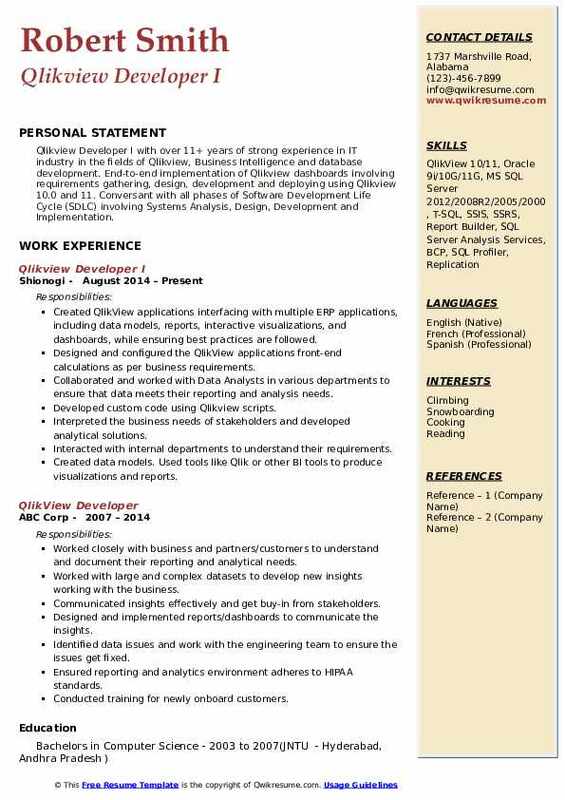 Objective : Junior QlikView Developer with 4+ years of IT industry experience in all aspects of Business intelligence applications with a strong background in Database development, Data Warehousing /Decision support systems, and Business Intelligence. 4 Years of experience in QlikView Development. Expertise in designing and modeling of QlikView Applications using QlikView with complex multiple data sources (SQL, Oracle, Flat Files, Excel and Access) relational designs. Working directly with business users to define and prototype QlikView applications. Responsible for handling QlikView/Qliksense requirements independently from scratch for the NYC branch. Working with senior management to plan, define and clarify dashboard goals, objectives and requirement. Designing, developing, testing, debugging and implementing QlikView solutions based upon specified requirement. Generating dashboards for different departments like credit risk, finance and rolled up sheets for the general manager of the firm. Maintenance of data in form of QlikView/Qliksense data files, pulling the data from the relevant database. Prepared Qliksense proof of concepts as per the requirements and specifications. Working knowledge of QlikView server, QlikView publisher, and QlikView enterprise version. Responsible for gathering requirements and communicating with the departments. Headline : Over 2 Years of Development experience as QlikView Developer. Extensive experience in Analysis, Design, Development, Implementation, Deployment, and maintenance of Business Intelligence and QlikView applications. Expertise in Business Objects enterprise Products (Universe Designer, Information Designer, Web Intelligence, Info View, CMS, CMC & CCM) , QlikView and their deployment. Experience in Creating and Managing QlikView Reports and Dashboards. Integral is a leader in implementing multi-model biometric solutions and applying them to identify intelligence, watch list checks and intelligence analysis. Integral also provides cybersecurity and it services to various federal clients. Responsible for gathering business requirements from various users of different stakeholders and managing the delivery. Responsible for building, publishing customized interactive reports and dashboards, report scheduling using QlikView server. Identifying, developing, and maintaining the key reporting requirements with business partners and internal departments to facilitate business continuity and development. Responsible for data modelling, data analysis, data integration and data visualization. Creating rich dashboards using QlikView dashboard and prepared user stories to create compelling dashboards to deliver actionable insights. Responsible for building sales, marketing and finance reports, and dashboards. Experience in working with QlikView server to create data sources, creating users and QlikView installation and providing training to business users in using QlikView. 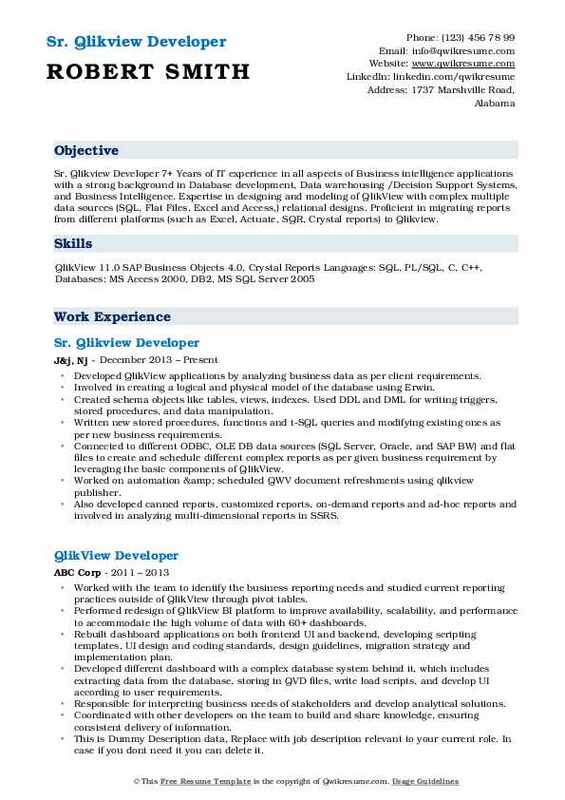 Headline : QlikView Developer with experience of over 5 years analyzing data in depth slicing and dicing through data bring out hidden valuable information using powerful BI tools QlikView 11.X/ 12.X, QlikSense 2.X/ 3.X, Tableau 9.X and Informatica PowerCenter 9.x/8.x/7.x. Extensive experience in QMC, session access, and report distribution as well pioneered in memory dashboard tooling. Experience working with various industries like Entertainment, Insurance, Telecommunication, Medical Services, Financial. Skills : Qlikview 11.X/ 12.X, QlikSense 2.X/ 3.X, Tableau Desktop, DOMO. ETL Tools: Informatica 8.x/9.x, Database : SQL, PL/SQL. Operating Systems: Windows 2007/XP, UNIX. Involving in all phases of the project life cycle including requirement gathering, analysis, coding, testing, and implementation. Documenting technical requirement specifications and detailed designs for ETL processes of moderate and high complexity. Submitted data requirements to ETL to generate the visualization available in the domo cloud. Involving in creating data models/mappings between source systems and warehouse components. Involving in generating 6 base QVDs that could be used across the organization with another dimension QVDs. Created QVs for all the base KPIs and the variables they include branding colors. Involved in analyzing the source data coming from different data sources such as SQL, XML, CSV etc. Developing data models supporting app requirements and in the dashboard, navigations triggered through objects corresponding to sheets. Generating Qliksense dashboard for client experience monitoring team with dynamic load and flexible expressions so that users can modify accordingly as the requirement standard varies. 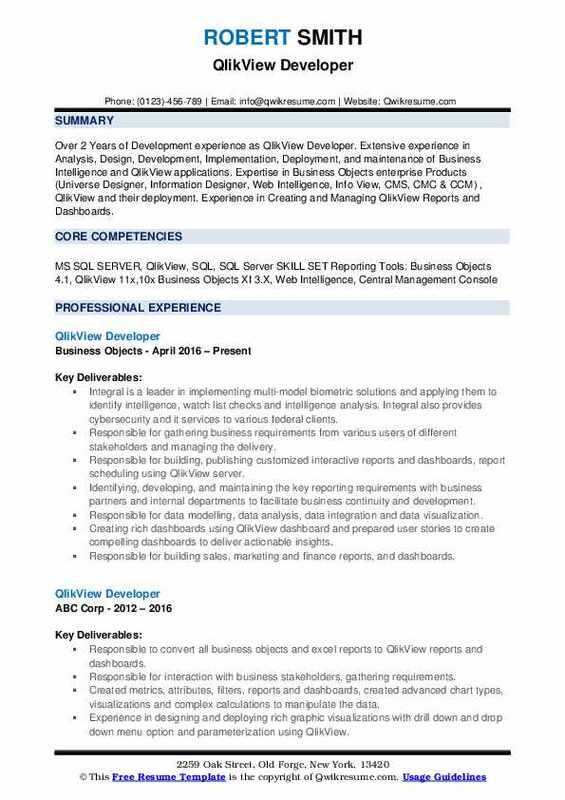 Headline : QlikView Developer with 6+ years of IT experience, including 4+years of experience in Designing and Development of Business intelligence application with Qlikview as BI tool. Extensive experience in developing different analytical applications using QlikView Product suite (QlikView Server, Publisher) Expertise in Installing and Configuring QlikView Desktop, QlikView Server, and QlikView Publisher. Developed Complex Graphical User Interactive reports using various Qlikview Objects. Developing a dashboard for rapidly integrate and analyze business intelligence data from clinical, financial and resource management systems for better operations and improved quality of care. Designing, developing, testing, debugging and implementing the QlikView solutions based upon specified requirement. Extracting, transforming and loading data from multiple sources into the QlikView applications. Creating visualizations like the stacked graph, trend chart, pie chart, straight table, pivot table. Performing testing of dashboards for functionality, data, performance, look and feel. Deploying applications on the production server and set up automated data reloads. Implementing section access and hidden scripting for the application security. 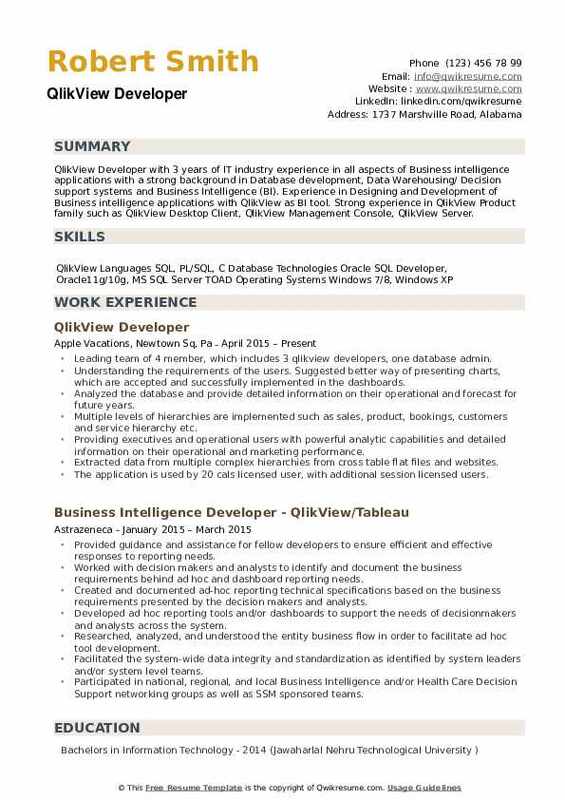 Summary : Senior QlikView Developer with over 8 years of professional experience in Information Technology with extensive experience in the field of Business Intelligence (BI) leveraging QlikView/BO for various domains like Finance, Banking, Healthcare, and Insurance sector. Experience in Designing, developing and deploying QlikView experience in SAP Business Objects Reporting Tool. In-Depth Knowledge in Requirement Gathering, Designing, and Data-Modeling for QlikView Dashboards. Migrated all the publisher tasks from QlikView 10 to 11 and applied the dependencies between the tasks. Involved in various prototype designs and helped the business analyst to understand the capabilities of the QlikView tool. Designed dashboards like "revenue growth analysis" to analyze the summarized information on the top 10 best performing, top 10 under-performing bank branches, trends of yearly, monthly loss ratios based on the selection of the bank branches/ managers/city/ state/ month/year dimensions. Developed dashboards for the financial details of the company with charts based on the metrics revenues, expenses, income, returns, margins etc. Identified the KPIs for the QlikView dashboards like loan revenue tracking, portfolio risk, number of new loans and loan type, total processing costs, non-performing loans, and net charge-offs etc. Designed and implemented the incremental loading using QVDs so that instead of reloading the entire data from the database, QlikView would only load the data worth of one day and concatenate it to the old data which is already stored in QVDs. Designed the data-model using various data sources like Oracle 10g/db2 database, XML, and Excel sheets. Summary : Sr. Qlikview Developer 7+ Years of IT experience in all aspects of Business intelligence applications with a strong background in Database development, Data warehousing /Decision Support Systems, and Business Intelligence. Expertise in designing and modeling of QlikView with complex multiple data sources (SQL, Flat Files, Excel and Access,) relational designs. Proficient in migrating reports from different platforms (such as Excel, Actuate, SQR, Crystal reports) to Qlikview. Developed QlikView applications by analyzing business data as per client requirements. Involved in creating a logical and physical model of the database using Erwin. Created schema objects like tables, views, indexes. Used DDL and DML for writing triggers, stored procedures, and data manipulation. Written new stored procedures, functions and t-SQL queries and modifying existing ones as per new business requirements. Connected to different ODBC, OLE DB data sources (SQL Server, Oracle, and SAP BW) and flat files to create and schedule different complex reports as per given business requirement by leveraging the basic components of QlikView. Worked on automation & scheduled QWV document refreshments using qlikview publisher. Also developed canned reports, customized reports, on-demand reports and ad-hoc reports and involved in analyzing multi-dimensional reports in SSRS. Created drill down reports which give all the details of various transactions like closed transactions, pending approvals, and summary of transactions and scheduled this report to run on a quarterly basis using SSRS (reporting services). Summary : QlikView Developer with around 7+ Years of IT experiences in all aspects of Business Intelligence applications with a strong background in Database development, Data warehousing/Decision Support Systems, and Business Intelligence. 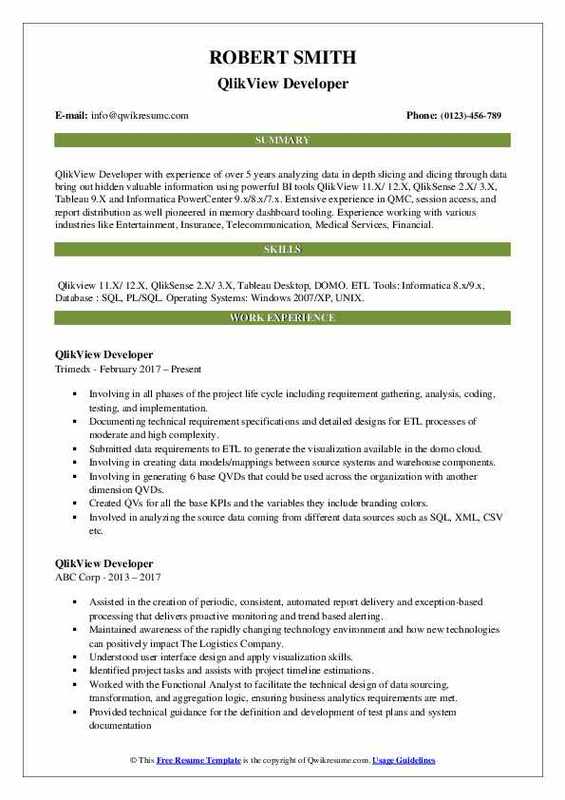 Around five years of experience in QlikView alone. Experience in Full Life Cycle development including Planning, Analysis, Design, Implementation, and Maintenance using QlikView. Working with Business Analyst and the business user to identify the user requirements, business reporting needs, layout, and developed the architecture of prioritized reports. Performing planning, design, and development of qlikview bi dashboards and data integration in a highly complex global services environment, interfacing qlikview. Actively participating in the design, architecture, and development of user interface objects in qlikview applications. Creating dashboard reports to track all the way through the ship to final acceptance phases. Developing executive dashboards in qlikview delivered through the web, enabling to measure the performance of the business with analytical capabilities. Installed, configured and deployed the application on qlikview server and imported data from different sources such as Oracle, SQL Server, MS Access, XML files and flat files using OLE DB/ODBC. Performing technical leadership in dashboard application design, visualization, automation, e-mail alert and notification, data modeling and the integration with the portal platform. 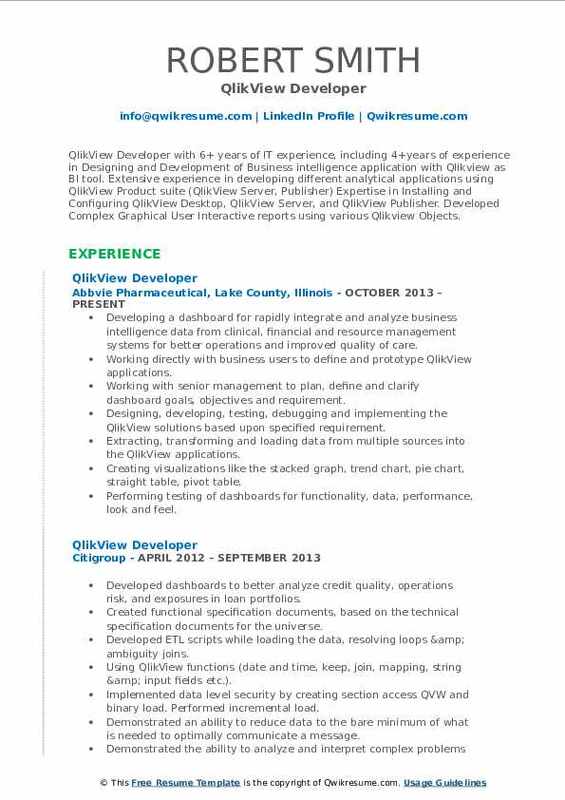 Headline : Qlikview Developer with over 5+ years of experience in Designing and Development of Business intelligence application with QlikView. Developed user interfaces, built data models and qlikview documents to design a Qlikview business intelligence solution using dashboards, alerts, queries, and reports. Excellent knowledge in importing data from various Data Sources like Excel Files, CSV Files, XML Files, MDB Files(.mdb, .accdb), Oracle 11g, SQL Server DB2 9.7 Database and other Databases. Involved in designing of QlikView solutions & full lifecycle implementations. Involved in extracting, transforming and loading data from different data source. Experience in the transformation of external data sources to QVDs and from QVDs to QVW reports. Developed extensively alerts, variables, input boxes, calendar & macros. Identification data sources and targets for data modeling and solution architecture. Troubleshooting and debugging experience working for production support. Developed all kind of graphical MIS reports like various charts and dashboards. Database structuring and database application design and development. Develop d effective QlikView data models on various databases like flat files, SQL 2000 & 2005, MS Access and Oracle to fetch the data into QVDs/models. 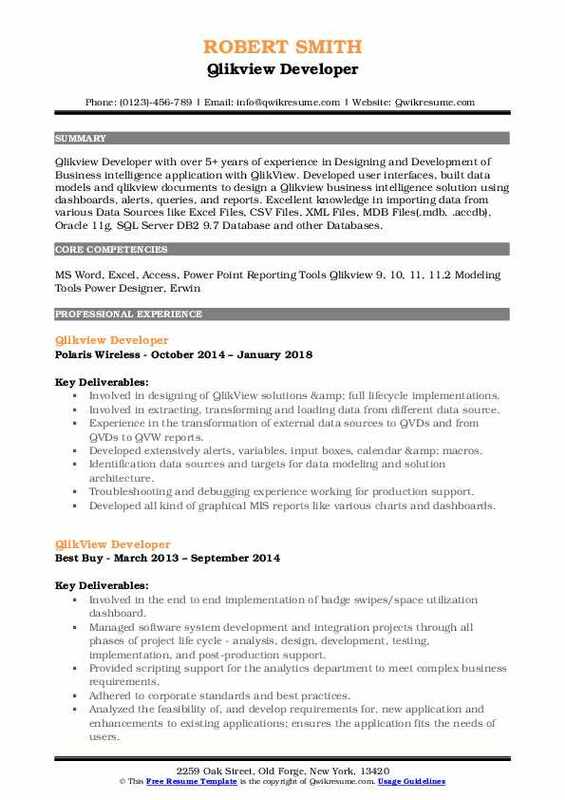 Summary : Qlikview Developer I with over 11+ years of strong experience in IT industry in the fields of Qlikview, Business Intelligence and database development. End-to-end implementation of Qlikview dashboards involving requirements gathering, design, development and deploying using Qlikview 10.0 and 11. Conversant with all phases of Software Development Life Cycle (SDLC) involving Systems Analysis, Design, Development and Implementation. Created QlikView applications interfacing with multiple ERP applications, including data models, reports, interactive visualizations, and dashboards, while ensuring best practices are followed. Designed and configured the QlikView applications front-end calculations as per business requirements. Collaborated and worked with Data Analysts in various departments to ensure that data meets their reporting and analysis needs. Developed custom code using Qlikview scripts. Interpreted the business needs of stakeholders and developed analytical solutions. Interacted with internal departments to understand their requirements. Created data models. Used tools like Qlik or other BI tools to produce visualizations and reports. Designed and executed new solutions and create advanced BI visualizations. Created and maintained design system documentation. Objective : QlikView Developer with 3 years of IT industry experience in all aspects of Business intelligence applications with a strong background in Database development, Data Warehousing/ Decision support systems and Business Intelligence (BI). 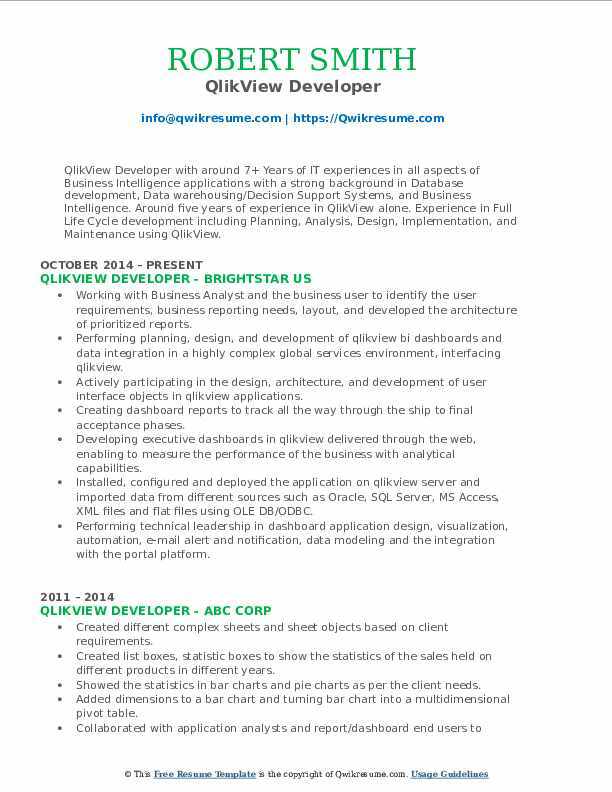 Experience in Designing and Development of Business intelligence applications with QlikView as BI tool. Strong experience in QlikView Product family such as QlikView Desktop Client, QlikView Management Console, QlikView Server. Leading team of 4 member, which includes 3 qlikview developers, one database admin. Understanding the requirements of the users. Suggested better way of presenting charts, which are accepted and successfully implemented in the dashboards. Multiple levels of hierarchies are implemented such as sales, product, bookings, customers and service hierarchy etc. Providing executives and operational users with powerful analytic capabilities and detailed information on their operational and marketing performance. Extracted data from multiple complex hierarchies from cross table flat files and websites. The application is used by 20 cals licensed user, with additional session licensed users. Ad hoc excel reports are created based on the business user requirements. Forecasting model is created by using booking, revenue applications, and created a 4-year forecast model and successfully implemented in qlikview.